Vehicles entering the transfer station must display municipal stickers. One free sticker was mailed out with each tax bill. Stickers may be purchased at Town Hall or the Transfer Station at a cost of $3 each. Must provide proof of residency. Property owners will receive a 50- and a 20-hole punch card with their property tax bills. Additional cards may be purchased at the Transfer Station or Town Hall at a cost of $20 and $50 each. The Wallingford Transfer Station accepts residential food scraps. Items allowed in the food scrap bin: vegetables and fruit peels, dairy products, meat, fish, bones, bread, rice, pasta, tea bags, grounds, filters, eggshells and soiled napkins. NOT allowed in the food scrap bin: cans, bottles, glass, paper products, cardboard, plastic bags, Styrofoam, disposable cups or cutlery, shrink wrap, oil and grease, pet or human waster, hazardous materials. For more information regarding composting at your home, click here. Rutland County Solid Waste District sells residential compost bins for $40. For more information, visit http://www.rcswd.com/, or call (802) 775-7209. Rutland County Solid Waste District sponsors Household Hazardous Waste days at the transfer station each year. This year, you may bring your hazardous waste free of charge to the transfer station on Saturday, May 18 and Saturday, October 12 from 8:00 a.m. to 10:30 a.m.
For a list of accepted household hazardous waste, click here. 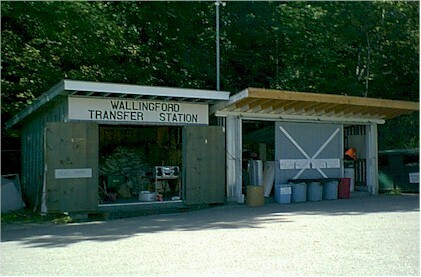 The Wallingford Transfer Station has Zero Sort recycling, so you no longer have to sort your recyclables. Just drop all your recyclables into in the Zero Sort bin. Residents may bring electronic waste to the Transfer Station and place in the appropriate bins in the shed. For a list of accepted items, click on here. The Vermont Legislature unanimously passed the Universal Recycling Law in 2012, which bans disposal of recyclables (metal, glass, plastics #1 and #2, paper and cardboard) by July 1, 2015; leaf and yard debris and clean wood by July 1, 2016; and food scraps by July 1, 2020. For more information about Act 148, visit the Department of Environmental Conservation’s web site at http://dec.vermont.gov/waste-management/solid/universal-recycling. Residents may bring leaves as well as yard waste under 1-inch in diameter to the transfer station on Saturdays. Yard waste fees: $2 per 30-gallon bag, $30 per yard. Leaves must be in compostable/biodegradable bags. Bags may be purchased at the transfer station ($1 for 2 bags) or at supply stores like Home Depot (remember, bags must be biodegradable/compostable). Brush, limbs and other yard debris must be no larger than 1-inch in diameter. See Transfer Station attendants to pay fees before dropping off yard waste in the designated area. The town of Wallingford belongs to the Rutland County Solid Waste District. Therefore, residents may also bring yard waste to the RCSWD Transfer Station on Gleason Road in Rutland. The district accepts leaves and grass, plus brush up to 24 inches in diameter and unlimited length for nominal fees. The leaves and grass clippings are used in a food waste compost program. The brush is chipped and sold to a biomass facility for the generation of electricity. Screened composted materials is available as a ready-for-the-garden finished product at $20.00 per ton (subject to availability). Trash Burning Trash burning is illegal in Vermont. The state’s Agency of Natural Resources has a public education effort called “Don’t Burn Vermont” to inform Vermonters about the harmful effects of trash burning, the penalties for violating the law, and low cost and convenient alternatives. You can find out more by visiting their website at www.dontburnvt.org or calling 802-241-3840. Free Hardcover Book Recycling Offer The RCSWD and GotBooks.com are sponsoring a free hardcover book recycling program. Any Wallingford resident, organization or business may bring to the Gleason Road Recycling Depot hardcover books for recycling at no charge. The books can be dropped off on Tuesdays, Thursdays and Saturdays when the Recycling Center is open. There is a box trailer on site where residents can put their books. For more information, contact the RCSWD at 775-7209. NO ENCYCLOPEDIAS, LAW BOOKS, MEDICAL JOURNALS PLEASE!